One email that I like to recommend is a Thank You email about two weeks out from their last purchase. It's just a very simple email that thanks them again for their business and offers a discount towards a follow-up purchase. This is a great way to get in front of your customer again in a friendly way that's also giving them some value. Many times you'll jog their memory that they need some kind of related item or other follow-up purchase. Keep the coupon code limited to 48 hours or perhaps a few days, because you don't want them to think that they can use that coupon code a year from now on their next purchase that they would have made anyways with you at full price. 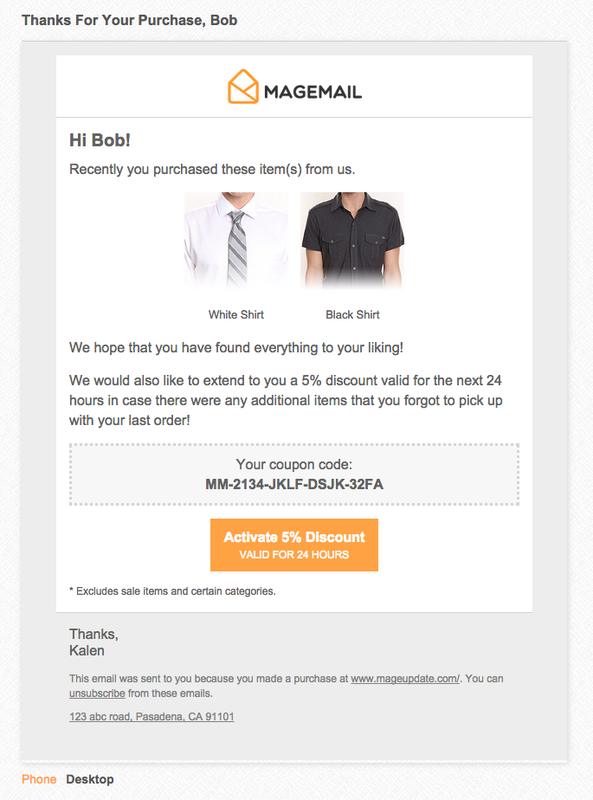 The purpose of this email is to drive a quick follow-up purchase, improving your repeat purchase rate.